Summary : I was expecting more from Lipton in this tea, as there other flavored black teas had been enjoyable. This one wasn't. Very weak and poor flavor makes this a forgettable tea...at best. Review : Yes, you have permission to hit me. I confess to committing the cardinal sin in the tasting of a new tea...I built up a positive expectation for this tea before tasting it. But really, I can't be faulted too much. After all, the other flavored black teas from the sampler pack I bought were by and large surprisingly good. And so, dimwit me, I naturally assumed this tea would at least be halfway decent too. I had bad vibes from this tea the minute I opened up the package, due to the lackluster aroma of this tea. You could smell a faint whiff of raspberry...but you did have to use your imagination a bit. 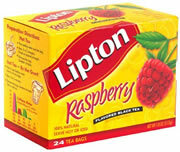 Here is how Lipton describes this tea on their website : "Brighten your day with LIPTON Raspberry Tea, a delicious blend of pure black tea leaves and natural raspberry flavors. A tangy taste that’s a refreshing, all natural change from your everyday tea. Plus, LIPTON Tea provides a healthy dose of protective flavonoid antioxidants." The tea contains the following ingredients : Fine imported black tea leaves, hibiscus flowers, rosehips, roasted chicory root, orange peel, roasted barley malt, natural raspberry flavor with other natural flavors (contains soy lecithin), licorice root. One would think with all these ingredients the taste of this tea would be rather strong, if not decent. But...that was not the case at all. The taste of this tea was exceptionally lackluster. It wasn't "bad" per se...it just was very, very weak. And not entirely pleasant, either. And while I wouldn't describe this tea as a "drain cleaner tea," it does come awfully close. Recommendation : No. This is neither a good black tea nor a good raspberry flavored tea. And in this particular blend, the raspberry infusion mixes with the black tea leaves to produce a lame a quickly forgettable taste. Brewing Instructions : Pour boiling water over tea bag. Let brew 3-5 minutes. For stronger flavor, brew the full five minutes. Bigelow Eggnogg'n Tea : No substitute for Real Egg-Nog! Adagio Teas Christmas Flavored Black Tea : Christmas in a cup, this excellent cinnamon flavored tea is sure to put anyone in the holiday mood. Ahmad Teas Strawberry Flavored Black Tea : A tasty strawberry flavored tea that will bring back the memories of summer.